Hello Loves. It has been a minute since I've written a post about someone who has inspired me in my nail art journey. I spend a lot of time showing you my work and talking about myself, but today I want to take some time to introduce and thank someone who has not only inspired me, but has also become a true online friend. As I've mentioned in the past, I never painted my nails before discovering gel. Regular polish just doesn't stick for me, so I didn't bother. What I may not have mentioned is that my nails were very plain for the first few years that I used gel polish. An accent nail of a different color was as bold and daring as I would go. 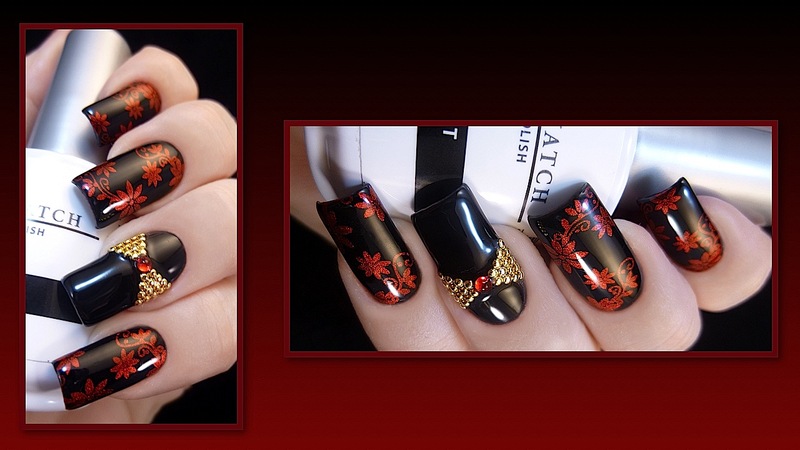 Then I met Kim through a facebook group, and her intricate manicures blew me away. At the time, neither of us had blogs, but we did have facebook and kept Kim's inbox full of questions about various techniques! Kim started blogging around the same time I created Manic Talons. If you don't already follow her, pop on over to Ten Little Canvases and do it now. Seriously, you'll thank me later. Her use of stamping and crystals blew me away. I messaged her and picked her brain on types, sizes, and applications of studs and crystals. Before long, I ordered a few and created my first crystal manicure. She has since done a wonderful tutorial that shows how to apply crystals with gel polish, and I'm betting she wishes she had this to send me to me back then when I was surely exhausting her with questions. lol Be sure to check it out here! Once I had the bling down pat, I looked back at that glorious stamping. I yet again I started messaging Kim and picking her brain. She recommended the Pueen Love Elements plates as a great starter set. I ordered them the same day and picked up a Wistonia squishy stamper. I created my first stamped manicure using that set and the rest is history. 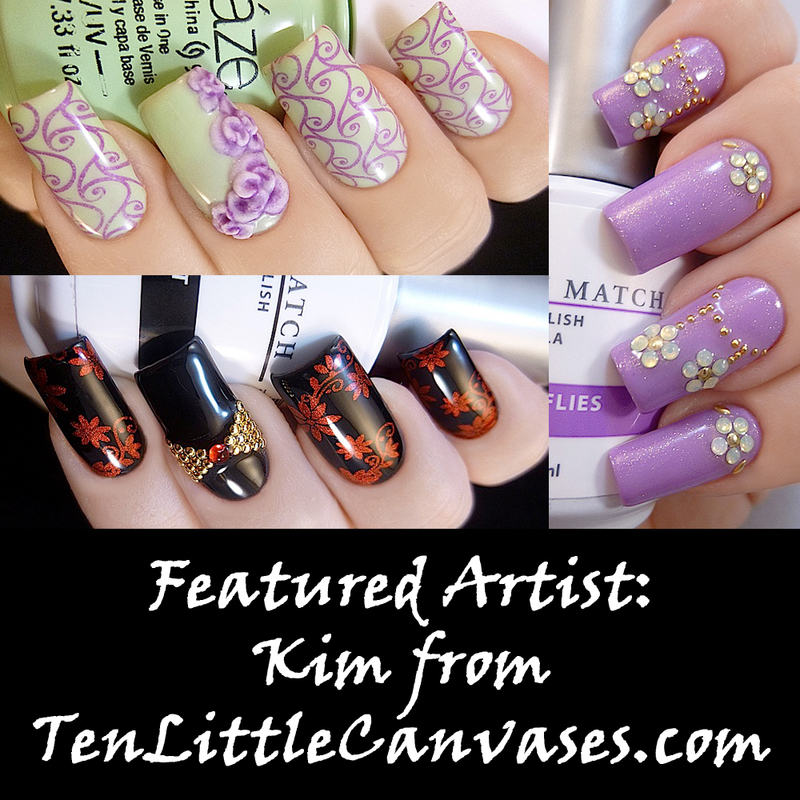 I have since found inspiration in other great stamping artists, but Kim continues to wow me with her artistic ability and inspire me to try new things. I mean, seriously, how does someone look at a pile of crystals and studs and see this???? But Kim doesn't stop there. She is constantly pushing the limits and trying new techniques. From watercolor to foils to acrylic flowers. Better still, she's been burning up youtube lately with tutorials on almost all of her designs! I'm constantly watching (cough*stalking*cough) to see what she'll come up with next. Like this recent foil creation, for example. Kim, thank you for always being an inspiration, pushing the limits and trying new techniques, and sharing them with us! Both of you are tops as far as my choice of blogs are concerned! You both have beautiful, creative manis. I'm amazed by what you can do with gel polish. 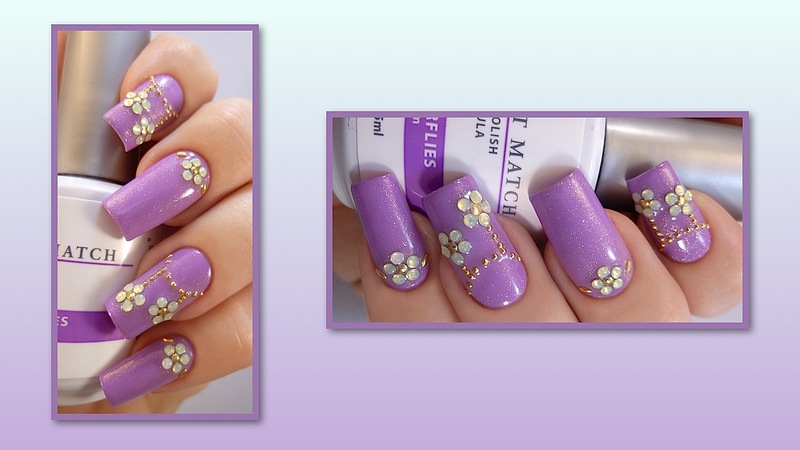 It's so lovely to read about a blogger's inspirations, and her nail art is so creative. I'm glad you did pick her brain, because I love to see your creations! Yay, another great nail artist to follow!!! 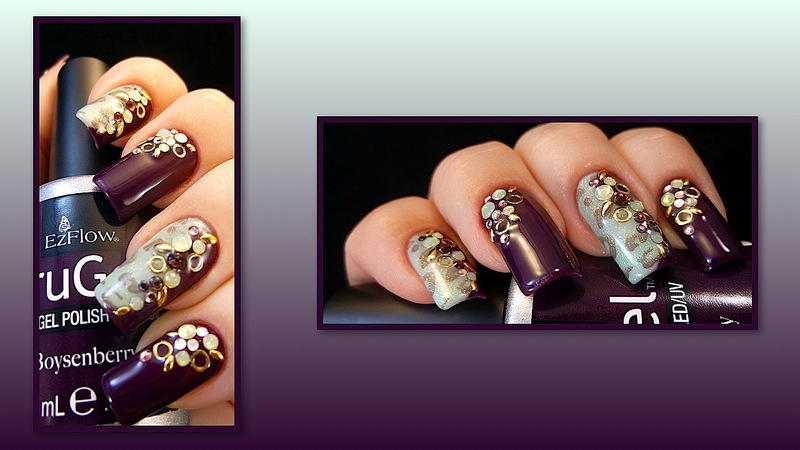 Gorgeous, this nail art inspires me even!! !